When you learned how to dive your instructor told you the most important part of choosing equipment was comfort and fit. When looking for a mask you also need a great field of vision well this mask was designed to meet those and more desirable qualities. The Sub-Frame Two-Windowed Mask is a Low Volume Mask which offers you a Wide Field of Vision and because of its Frame Design is one of the most Durable Masks found on the market today. This Durability has been achieved with a Sub-Frame that is Molded-and-Bonded directly to the Masks Silicone Rubber Skirt. A second Frame made of Corrosion Resistant 316-Grade Stainless Steel Protects the Nose Bridge area and adds Strength and Ultimate Durability. Mask has Optical Quality Glass Lenses and Squeeze-to-Adjust Buckles. The Atomic Sub-Frame Mask offers a new standard feature never seen or Seen Through" before in a Diving Mask. Atomic calls them Ultra-Clear Lenses. What makes Ultra-Clear special? Did you ever notice that Normal Dive Mask Lenses have a Green Tint to the Glass? To see this Tint, put your existing mask up to a piece of white paper and see for yourself. The Green Tint you see is the result of Iron Impurities left over in Lower Quality Float" or Window type Glass. That Green Tint Distorts True Colors and Blocks-Out some of the Light that Reaches the Eye. Ultra-Clear is a new and exciting Optical Quality Tempered Glass with Exceptional Clarity and High Light Transmission, with No Color Distortion. The Exceptionally High Light Transmittance and Lack of Distortion in the Ultra-Clear Lens Maximizes the Light available for Improved Visual Acuity, especially Underwater in Low Light Conditions, Better Vision, Truer Colors is what you get with Atomic Aquatics Ultra-Clear Lenses. 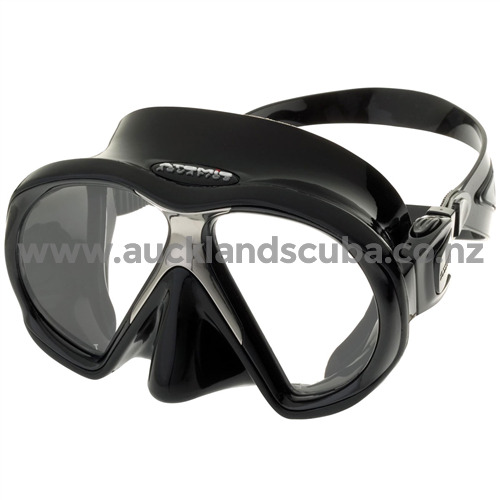 If you need to use Corrective Lenses the Atomic Aquatics Sub-Frame Mask has Optional Corrective Lenses available. The Atomic Aquatics Sub-Frame Mask has a Double Feathered Edge Skirt that provides an Excellent Seal on the Divers Face with a Easy-to-Reach One-Handed Nose Well for Ear Equalization. The Wide Split Style Mask Strap Increases the Masks ability to conform to your Face adding to its great Sealing Ability. 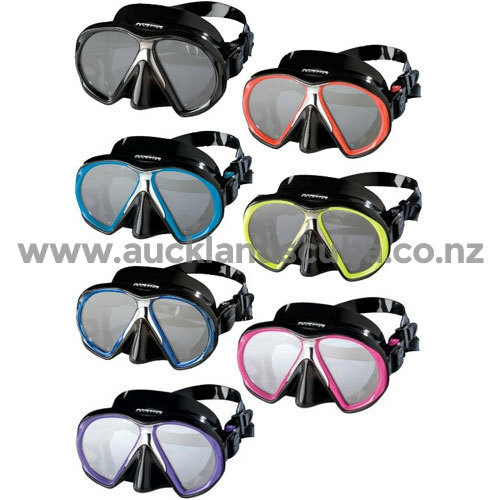 The Mask is available in 2 sizes of Regular and Medium to fit most divers' faces. The Sub-Frame Mask comes in 7 color choices of Black, Yellow, Pink, Purple, Royal Blue, Red or Blue all with a Black Silicone Rubber Skirt and Mask Strap. The Atomic Sub-Frame Mask is so durable it carries a Lifetime Warranty against Frame Breakage! Mask also comes with a Mask Box. Lifetime Warranty Against Frame Breakage!